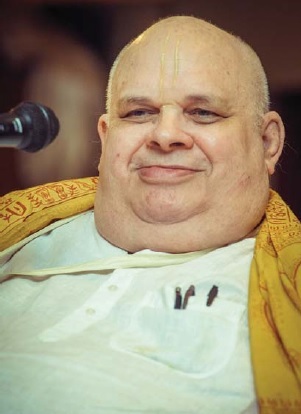 Brahmananda Dasa, one of the earliest devotees who surrendered to Srila Prabhupada in New York left this world on 7th June, 2015 in Sri Vrndavana Dhama. He had been ill for some time and was being taken to Delhi where he was to undergo treatment in a hospital for better health. Brahmananda Dasa (Bruce Scharf) was drawn to Srila Prabhupada in their very first meeting and as soon as he heard the Hare Krishna maha-mantra he immediately accepted it as a daily spiritual practice. He had already become a vegetarian and was reading the Bhagavad-gita even before he met Srila Prabhupada. He started his job by offering his complete salary to Srila Prabhupada every month. He was so affected by Srila Prabhupada’s message that he also brought his own brother to Krishna consciousness who later became Garga Muni Dasa. Seeing his eagerness and sincerity, he was handed over many important responsibilities related to temple management, like cooking, handling cash, etc. When Srila Prabhupada needed a visa extension, he even begged money from strangers in a park so that his “father” could continue staying in the USA. Brahmananda Dasa was responsible for getting Macmillan Publishers to publish the first edition of Srila Prabhupada’s Bhagavad-gita As It Is in the West. His deep attachment for Srila Prabhupada was also reflected in his surrender to Srila Prabhupada’s instructions. He practically risked his life by traveling to countries in turbulent East Asia and Africa to distribute the message of Lord Krishna . Any small mistake could have cost him his life, but he was undaunted. We deeply lament his separation and pray to him for his blessings to continue to serve in Srila Prabhupada movement.